A robust manufacturing sector is an essential element of the Indian growth story. It is particularly important in ensuring employment for a large and growing working age population. Manufacturing, currently at 15% of GDP, needs to grow at a rate 2-3% higher than GDP, in order to make a significant contribution to our economy and towards employment generation. The capital goods sector is of strategic importance in enabling robust manufacturing sector growth. Recognising this, the planning commission has targeted a 5% higher growth in the capital goods sector during the 12th plan, compared to the 11th plan period. While domestic demand has grown at a robust pace in several sectors, domestic capital goods manufacturers have not been able to catch-up with this surge, leading to an increasing dependence on imports, across market segments. Large Indian demand in the capital goods sector provides an able platform to scale up, potentially catapulting Indian players for a larger role in global markets. There is the need to move towards a more collaborative approach with end users, a greater focus on formation of manufacturing clusters for improved economics, sustained efforts to bridge the technology gap between Indian and global players and supported by an enabling infrastructure for capital goods manufacturers at large. 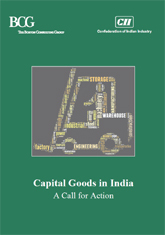 The CII-BCG report "Capital Goods in India: A Call for Action" captures some of the challenges and opportunities available in the sector today. A 10 point action agenda is also proposed for the capital goods sector that will enable policy makers and industry to help ensure that this sector continues to remain the manufacturing growth engine for India in the years ahead. The report was released at the National Conference on Emerging Opportunities for the Capital Goods Industry organised by CII on 26 November at New Delhi.